She entered her first music contest in Canton, N.C., when she was still playing her “cheap 10 cent banjo,” Samantha Bumgarner told a Sylva [NC] Herald reporter years later. Samantha’s father Has Biddix played the fiddle, but had not been keen for his daughter to take up that instrument, still in the late 19th century nicknamed by some “the Devil’s Box.” Samantha recalled that she did “sneak” the fiddle out to practice on her own. 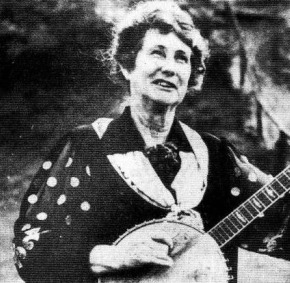 Has allowed her to have a banjo, at first home-made— “a gourd with a cat’s hide stretched over it and strings made of cotton thread waxed with beeswax”—later replaced by the aforementioned cheap store model. It took awhile for the promising young musician to gain widespread recognition, though. She was 37 years old when Columbia Phonograph Company took notice of her and invited her and Eva Smathers Davis to New York City to record for them.